Financial statements for the DTO Annual Report 2015–16. In our opinion, the attached financial statements for the year ended 30 June 2016 comply with subsection 42(2) of the Public Governance, Performance and Accountability Act 2013 (PGPA Act), and are based on properly maintained financial records as per subsection 41(2) of the PGPA Act. In our opinion, at the date of this statement, there are reasonable grounds to believe that the Digital Transformation Office will be able to pay its debts as and when they fall due. Total departmental expenses for 2015–16 were in line with the estimate published in the 2015–16 Portfolio Budget Statements. The variance for Employee benefits and Suppliers is attributable to a greater reliance on labour hire contractors due to a lower than expected ASL cap from what was originally budgeted. Total departmental Revenue from Government for 2015–16 was $1.884 million (7%) higher than the estimate published in the 2015–16 Portfolio Budget Statements. This is primarily attributable to additional Revenue from Government received in additional estimates ($1.370 million) and current year funding for the transfer of a function from the Department of Finance ($0.514 million). Total departmental financial assets for 2015–16 were $10.310 million higher than the estimate published in the 2015–16 Portfolio Budget Statements. The increase is primarily attributable to the amount of unspent appropriation receivable due to Revenue from Government not being fully expended and a higher than expected accrued suppliers balance. Total departmental non-financial assets are higher than the estimate published in the 2015–16 Portfolio Budget Statements by $0.797 million (41%) due to the transfer of intangible assets and prepayments as a result of machinery of Government changes. Departmental payables mainly consist of accrued supplier expenditure disclosed against a nil balance published in the 2015–16 Portfolio Budget Statements. Total departmental provisions are higher than the estimate published in the 2015–16 Portfolio Budget Statements by $1.018 million. This is attributable to the transfer of staff provisions as a result of machinery of Government changes and the recognition of a makegood provision for the office leased in Canberra. Return of appropriation under section 51 of PGPA Act reflects the return of $2.226m of unused funding for the development of the Grants Warehouse appropriated to the Digital Transformation Office in Appropriation Act 2 2015/16. Restructuring of $1.992m reflects the transfer of functions from the Department of Finance ($1.003m) and the transfer of plant and equipment to assist with the establishment of the Digital Transformation Office as its own Executive Agency from the Department of the Prime Minister and Cabinet ($0.989m). Amounts appropriated which are designated as ‘equity injections’ for a year (less any formal reductions) and Departmental Capital Budgets (DCBs) are recognised directly in contributed equity in that year. The FRR require that distributions to owners be debited to contributed equity unless it is in the nature of a dividend. Departmental contributed equity for 2015–16 was $1.266 million (57%) higher than the estimate published in the 2015–16 Portfolio Budget Statements. This is attributable to $1.500 million of Departmental Capital Budgets received in Appropriation Act 3 2015–16 and $1.992 million of assets assumed as a result of machinery of Government, offset by the return of $2.226 million equity funding following a section 51 quarantine. Departmental retained earnings for 2015–16 were $2.203 million higher than the estimate published in the 2015–16 Portfolio Budget Statements. This is mainly attributable to additional Revenue from Government received in additional estimates ($1.370 million) and current year funding for the transfer of function from the Department of Finance ($0.514 million). Departmental net cash from operating activities is $1.615 million higher than the estimate published in the 2015–16 Portfolio Budget Statements. This is primarily attributable to the drawing of operating funding to purchase property, plant and equipment ($2.970 million) offset by Departmental Capital Budget funding of $1.500 million. Departmental net cash used by investing activities is $0.744 million (33%) higher than the estimate published in the 2015–16 Portfolio Budget Statements. This is attributable to an increase in the purchase of property, plant and equipment. Departmental net cash from financing activities is $0.726 million (33%) lower than the estimate published in the 2015–16 Portfolio Budget Statements. This is attributable to the section 51 quarantine of equity funding ($2.226 million) for the Grants Warehouse offset by Departmental Capital Budget funding ($1.500 million) received in Appropriation Act 3 2015–16. The Digital Transformation Office (the DTO) is a not-for-profit Australian Government controlled Executive Agency established on 1 July 2015. The objective of the DTO is to transform government services so they are easy to find, simple to use and convenient to access in a secure way. Outcome 1: To improve the user experience for all Australians accessing government information and services by leading the design, development and continual enhancement of whole-of-government service delivery policies and standards, platforms and joined-up services. To support the Prime Minister in transforming government services to improve the user experience, cut red tape and ensure services are delivered efficiently. The continued existence of the DTO in its present form and with its present programmes is dependent on Government policy and on continuing funding by Parliament for the DTO’s administration and programmes. The financial statements are general purpose financial statements and are required by section 42 of the Public Governance, Performance and Accountability Act 2013.
b. Australian Accounting Standards and Interpretations issued by the Australian Accounting Standards Board (AASB) that apply for the reporting period. The financial statements have been prepared on an accrual basis and in accordance with the historical cost convention, except where certain assets and liabilities are recorded at fair value. Except where stated, no allowance is made for the effect of changing prices on the results or the financial position. As the DTO was established as an Executive Agency on 1 July 2015, there will be no comparative figures disclosed. Other new standards, revised standards, interpretations and amending standards that were issued prior to the sign-off date and are applicable to the current reporting period did not have a material financial impact, and are not expected to have a future material financial impact on the DTO. No new/revised/amending standards and/or interpretations issued by the AASB prior to the sign-off date are expected to have a future material impact on DTO’s financial statements which are applicable to the DTO for future reporting periods. The DTO is exempt from all forms of taxation except Fringe Benefits Tax (FBT) and Goods and Services Tax (GST). There are no known events occurring after the reporting period that could impact on the financial statements. Amounts appropriated for departmental appropriations for the year (adjusted for any formal additions and reductions) are recognised as Revenue from Government when DTO gains control of the appropriation, except for certain amounts that relate to activities that are reciprocal in nature, in which case revenue is recognised only when it has been earned. 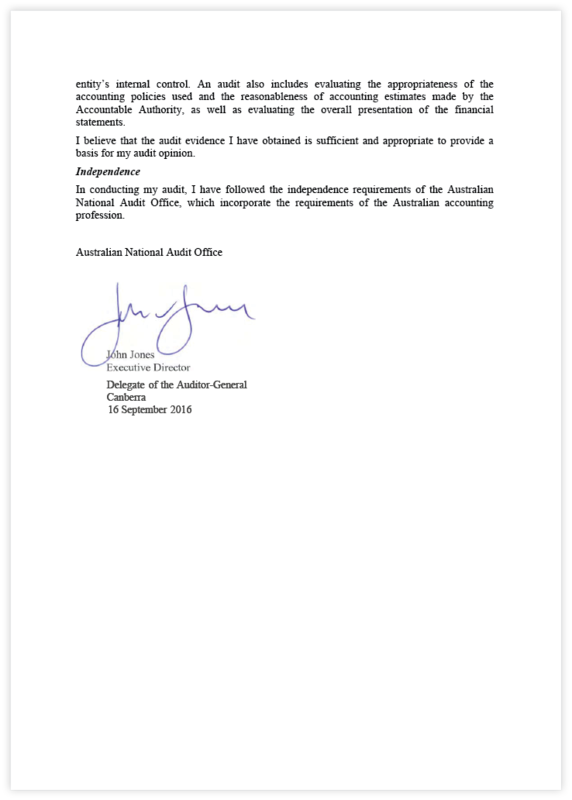 Appropriations receivable are recognised at their nominal amounts. This section analyses the financial performance of the Digital Transformation Office for the year ended 2016. Accounting policies for employee related expenses is contained in the People and relationships section. Note: Commitments are GST inclusive where relevant. Office accommodation lease payments are subject to periodic increases in accordance with the rent review provisions in the lease agreements. The DTO has one lease that contains three, one year renewal options. The options require a minimum of six months’ notice if the option for renewal is to be exercised. The DTO has one MOU for the leasing of premises which has a provision requiring the premises to be restored to their original condition at the conclusion of the lease. The DTO has made a make good provision to reflect the present value of this obligation. A distinction is made between finance leases and operating leases. Finance leases effectively transfer from the lessor to the lessee substantially all the risks and rewards incidental to ownership of leased assets. An operating lease is a lease that is not a finance lease. In operating leases, the lessor effectively retains substantially all such risks and benefits. Resources received free of charge are recognised as revenue when, and only when, a fair value can be reliably determined and the services would have been purchased if they had not been donated. Use of those resources is recognised as an expense. Resources received free of charge are recorded as either revenue or gains depending on their nature. This section analyses the Digital Transformation Office’s assets used to generate financial performance and the operating liabilities incurred as a result. Employee related information is disclosed in the People and Relationships section. Receivables have been assessed for impairment and no allowance has been made as at 30 June 2016. Property, plant and equipment is the generic term that covers leasehold improvements and plant and equipment. Purchases of property, plant and equipment and intangibles are recognised initially at cost in the Statement of Financial Position, except for purchases costing less than $2,000, which are expensed in the year of acquisition. The initial cost of an asset includes an estimate of the cost of dismantling and removing the item and restoring the site on which it is located. This is particularly relevant to ‘make good’ provisions in property leases taken up by the DTO where there exists an obligation to restore the asset to its original condition. These costs are included in the value of the DTO’s leasehold improvements with a corresponding provision for the ‘make good’ recognised. The entity’s intangibles comprise of internally developed software for internal use. These assets are carried at cost less accumulated amortisation and accumulated impairment losses. Amortisation rates apply to intangibles and are based of the useful life of 2 to 3 years. Depreciable property, plant and equipment assets are written-off to their estimated residual values over their estimated useful lives to the DTO using, in all cases, the straight-line method of depreciation. Depreciation rates (useful lives), residual values and methods are reviewed at each reporting date and necessary adjustments are recognised in the current, or current and future reporting periods, as appropriate. All assets were assessed for impairment during 2016. Where indications of impairment exist, the asset’s recoverable amount is estimated and an impairment adjustment made if the asset’s recoverable amount is less than its carrying amount. A write-down of $957,000 was recognised in 2016 for Leasehold Improvements for the write-off of the South Tower of level 3 50 Marcus Clarke Street due to the termination of the lease. An item of property, plant and equipment is derecognised upon disposal or when no further future economic benefits are expected from its use or disposal. Settlement is usually made within 30 days. Supplier and other payables are recognised at amortised cost. Liabilities are recognised to the extent that the goods or services have been received (and irrespective of having been invoiced). The entity currently has one MOU agreement for the leasing of premises which has a provision requiring the entity to restore the premises to their original condition at the conclusion of the lease. Provision for the restoration of leased premises (makegood) is based on future obligations relating to the underlying assets. The provision is disclosed at the present value of the obligation utilising the appropriate Government bond rate. This section identifies the Digital Transformation Office funding structure. Shared Service Centre spends money from the Consolidated Revenue Fund (CRF) on behalf of DTO. The variance in departmental ordinary annual services is mainly attributable to undrawn current year appropriations due a higher than expected accrued expense balance. Departmental Capital Budgets are appropriated through Appropriation Acts (No. 1,3,5). They form part of ordinary annual services and are not separately identified in the Appropriation Acts. The current year Equity injection is shown exclusive of the Section 51 Permanent Quarantine, which has reduced contributed equity by $2.226 million. During 2015–16, the Shared Services Centre provided the DTO with Treasury services. This section describes a range of employment and post employment benefits provided to our people and our relationships with other key people. Liabilities for ‘short-term employee benefits’ (as defined in AASB 119 Employee Benefits) and termination benefits due within twelve months of the end of reporting period are measured at their nominal amounts. The liability for employee benefits includes provision for annual leave and long service leave. The leave liabilities are calculated on the basis of employees’ remuneration at the estimated salary rates that will be applied at the time the leave is taken, including the DTO’s employer superannuation contribution rates to the extent that the leave is likely to be taken during service rather than paid out on termination. The provision is disclosed at the present value of the obligation using the short hand method that utilises the appropriate Government bond rate. No provision has been made for sick leave as all sick leave is non-vesting and the average sick leave taken in future years by employees of the DTO is estimated to be less than the annual entitlement for sick leave. The DTO’s staff are members of the Commonwealth Superannuation Scheme (CSS), the Public Sector Superannuation Scheme (PSS), the PSS accumulation plan (PSSap) or another fund of their choice. The liability for defined benefits is recognised in the financial statements of the Australian Government and is settled by the Australian Government in due course. This liability is reported in the Department of Finance’s administered schedules and notes. The DTO makes employer contributions to the employees’ superannuation scheme. For Commonwealth defined benefits schemes, these rates are determined by an actuary to be sufficient to meet the current cost to the Government. The DTO accounts for the contributions as if they were contributions to defined contribution plans. The liability for superannuation recognised as at 30 June represents outstanding contributions for the final fortnight of the year. During the year, the total number of senior management personnel that were utilised and are included in the above table is 21. The additional positions reported relate to the short-term employment and secondment arrangements during 2015–16 to support the establishment and development of the DTO. As at 30 June 2016, the DTO has nine senior management positions. This section analyses how the Digital Transformation Office manages financial risks within its operating environment. The DTO is not aware of any material departmental quantifiable or unquantifiable contingent assets or liabilities as at the signing date that would require disclosure in the financial statements. Contingent liabilities and contingent assets are not recognised in the Statement of Financial Position but are reported in the relevant schedules and notes. They may arise from uncertainty as to the existence of a liability or asset, or represent an asset or liability in respect of which the amount cannot be reliably measured. Contingent assets are disclosed when settlement is probable but not virtually certain and contingent liabilities are disclosed when settlement is greater than remote. The fair value of financial instruments approximate their carrying amounts. The DTO’s financial liabilities are suppliers payable. The exposure to liquidity risk is based on the notion that the DTO will encounter difficulty in meeting its obligations associated with financial liabilities. This is highly unlikely due to appropriation funding and mechanisms available to the DTO and internal policies and procedures put in place to ensure there are appropriate resources to meet its financial obligations. The DTO holds basic financial instruments that do not expose the DTO to interest risk, currency risk or other price risk. The following tables provide an analysis of assets that are measured at fair value. The remaining assets and liabilities disclosed in the statement of financial position do not apply the fair value hierarchy. The different levels of the fair value hierarchy are defined below. 1 DTO’s assets are held for operational purposes and not held for the purposes of deriving a profit. 2 No revaluation has been performed in 2015–16 as all assets were transferred or purchased in the current year representing a proxy for fair value. Net assets received from or relinquished to another Australian Government entity under a restructuring of administrative arrangements are adjusted at their book value directly against contributed equity. During 2015/16, PM&C relinquished $0.989 million in plant and equipment to assist with the establishment of the Digital Transformation Office as its own Executive Agency on 1 July 2015. As part of the Administrative Arrangement Orders issued by the Government on 21 September 2015, the Gov 2.0 function (and associated assets and liabilities) was transferred from the Department of Finance. 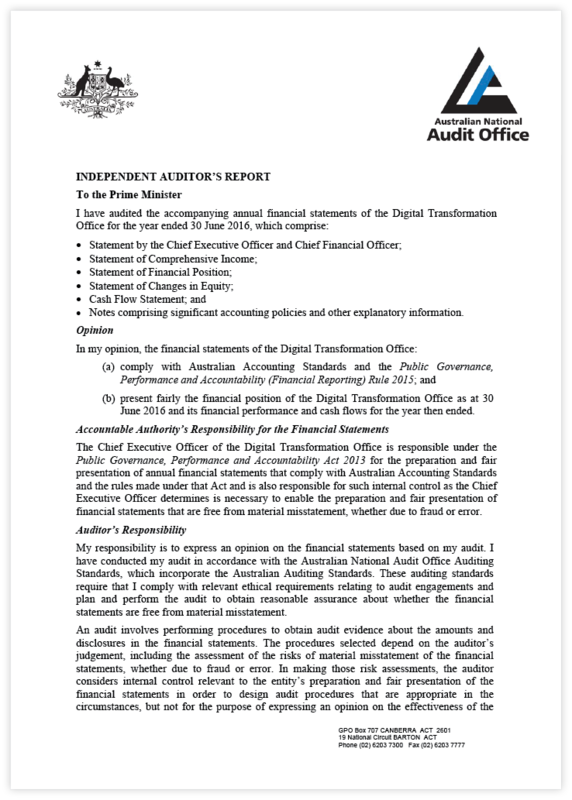 As the Digital Transformation Office has one Outcome, the Reporting of Outcomes is disclosed in the Statement of Comprehensive Income and Statement of Financial Position.